Nutritionists used to think that the health benefits of chocolate had more to do with remembering Valentines Day than with preventing heart disease. With lots of fat and even more calories, chocolate had no healthful qualities whatsoever...or so they thought. Scientists today, however, are subjecting brave volunteers to clinical trials of chocolate. Their goal: to find compounds in chocolate that fight heart disease, boost the immune system, and even make people live longer. The current interest in chocolate follows the discovery that red wine appears to prevent heart disease. Four years ago, a couple of nutritionists investigating red wine decided to test some chocolate from a nearby vending machine. They discovered huge quantities of antioxidants, the same good-for-you chemicals in fruits, vegetables, wine, and tea. Since their discovery, candy companies such as Mars have sponsored scientists across the country in the pursuit of happiness and a healthful chocolate bar. In the ensuing feeding frenzy, researchers have announced that chocolate contains more antioxidants than your favorite green and orange vegetables. This past February, a university group sponsored by Mars reported that, like aspirin, chocolate thins the blood, which helps prevent heart attacks. Mars also funded a nutritionist to investigate the historical use of chocolate as a medicine, perhaps searching for additional health claims. Scientists debate whether the chemicals in chocolate have a positive effect. But if the candy companies have their way, your doctor might someday prescribe chocolate for your health. The chemicals responsible for the buzz about chocolate and red wine are plant compounds bearing long and cumbersome names like polyphenols, flavonoids, and cyanidins. Most scientists simply use the name phenols. Plants make phenols to protect their cells from damage and disease (even sunburns). Fruits and vegetables are loaded with phenols, which protect the precious seeds inside. Many studies have shown that eating lots of fruits and vegetables seems to protect people too; they have lower incidences of cancer, heart disease, colds, and other illnesses. It could be that fruits and vegetables have this effect because they contain fewer calories and fat than meat and dairy products. Researchers have shown that phenols seem to make a heart healthy, but the results dont prove that only phenols that fight heart disease. In the recently completed "Seven Countries Study," researchers analyzed the diets and diseases of several nations. They found that although people in France typically eat foods that are higher in fat, calories, and cholesterol than Americans, their hearts are healthier and their cholesterol levels are lower. The reason fewer people die from heart disease in France than in America? Authors of the study say its copious amounts of red wine. The deep red color and strong, sometimes even bitter taste of red wine come from the phenols in grapes. The phenols work their magic by preventing a chemical reaction called oxidation turns cholesterol into plaque on artery wallshence the name antioxidants. This buildup is the most common cause of heart disease, and the French have been unwittingly protecting themselves by drinking red wine. 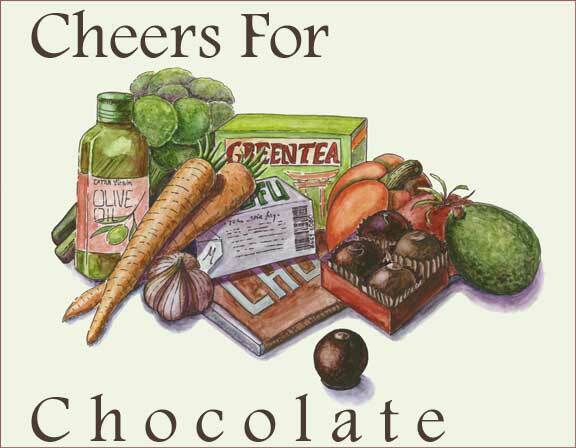 Chocolate contains the same phenols as red wine. So what exactly are phenols? Phenols are simple molecules, made of a few oxygen and hydrogen atoms. They course through the body, neutralizing molecules called free radicals that skulk around the bloodstream. Free radicals are missing an essential ingredient, an electron, so they try to scavenge electrons from cells. This damages the cells. Antioxidants contribute an electron in defense. The body has its own set of riot police to stop the radicals, but the system breaks down as the body ages. Scientists think the attacks by free radicals, and the damage they cause, leads to heart disease and some kinds of cancer, as well as the general deterioration of the body with age. Like the antioxidants in red wine, the phenols in chocolate battle the oxidation reaction that lead to the buildup of plaque. This buildup narrows the arteries, slowly cutting off the oxygen supplyor stranglingthe heart muscle. Humans have enjoyed red wine and chocolate for thousands of years, but probably not for their phenols. The agreeable effects of wine on the human body are well known, and the drink tastes pleasant. Chocolate beans, however, are extremely bitter, a taste associated with poisonous plants. "Youd have to be pretty tough to sit down and chew these suckers up," University of California at Davis nutritionist Louis Grivetti says of chocolate. Mars sponsored his historical research of chocolate as medicine. Ancient Central American societies probably first used cocoa beans for their tannins, to tan animal hides and make leather. The tannins, which are another type of phenol, are acidic and soften the hides. The same tannins produce the tart taste and red color of wine and cranberries. Grivetti suspects that a dog or a child snacking on a garbage heap ate some of the beans leftover from the stewing process used to extract the tannins. When the nibbler didnt die, observant adults realized they could safely eat the beans. That first exploratory tasting led to an exciting discovery, Grivetti hypothesizes. "Ancient societies exhaustively searched for and used mind-altering compounds," says Grivetti. "If you chew the bean, you do have a slight mental change." That change is due to caffeine and other stimulants. The Olmec and other Mexican cultures used chocolate as a stimulant as far back as three thousand years ago, taken as a drink made from pulverized cocoa beans. The active ingredients producing this effect are caffeine, our favorite legal stimulant, and theobromine, its lesser-known cousin. Caffeine revs up the nervous system, suppressing tiredness, but theobromine affects other parts of the body. It dilates blood vessels and stimulates muscles, which may be why the Aztecs used it as natures version of Viagra. The Aztec emperor Montezuma typically drank a special concoction called chocolatl before visiting his harem, and some newlyweds would share a cup of elixir before their wedding night. Notes taken by Spanish conquistadors show that chocolatl was a frothy combination of cocoa beans, spices, and honey. 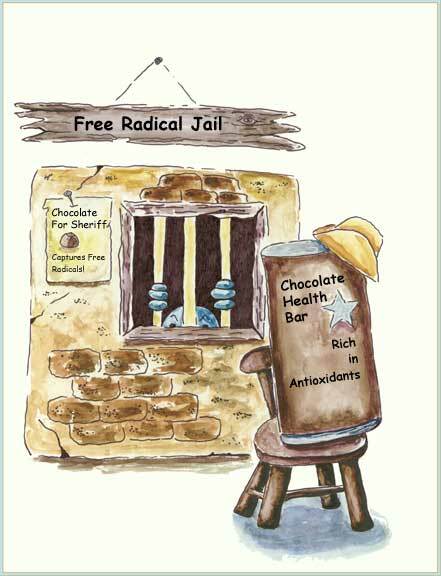 Despite its stimulants, ancient and modern doctors prescribed chocolate as a tranquilizer. The calming and soothing effects are likely the results of amines, which mimic the actions of certain brain chemicals. One compound duplicates a hormone that produces the pleasurable feelings of love. In 1996, researchers from the University of California at San Diego reported the presence of another chocolate chemical that turns on a particularly interesting part of the brainthe same one activated by marijuana. Perhaps the hippies baking marijuana brownies in the 1960s actually hit upon this link. Evidence for the length of humanitys devotion to chocolate comes from a small village in central Honduras. Chocolate is the reason why people have continuously occupied the village for more than three thousand years, says archaeologist John Henderson of Cornell University. Sites this old are rare in the Old World and even rarer in the New World. The village is located in the Ulua Valley, carved by a periodically flooded river. The reason people repeatedly rebuilt on top of their flood-ravaged homes was the lure of a rich supply of cocoa beans, says Henderson. Pottery shards in the river silts come from finely made bowls common to the Olmec, a culture that flourished in communities far to the west of the village. "The pottery shares the shape and decorative style," says Joyce. The markings on the bowls indicate they held a drink for the elite of the Olmec societythe only people permitted to drink chocolate, says Joyce. She and Henderson think the Olmec traded the pottery for beans from plentiful cacao trees surrounding the village. With all these historical uses, should it be a surprise that chocolate could have true disease-fighting properties? Chocolate not only hinders plaque buildupnew results show there is another line of attack. The phenols in chocolate actually thin your blood, thus inhibiting blood clot formation. Nutritionists from UC Davis reported these results in February at the annual meeting of the American Association for the Advancement of Science. In a study led by UC Davis nutritionist Carl Keen, researchers gave human volunteers about a tablespoon of cocoa powder (provided by Mars), much like unsweetened baking cocoa you buy at the grocery store. The cocoa powder was mixed with water and a little sugar to take the bitter edge off the taste. Keen also gave subjects of this not so inhumane human trial water with caffeine as a control. He wanted to be sure caffeine wasnt affecting the blood. About two hours after the subjects drank the cocoa mixture, the levels of phenols peaked in their bloodstream, fading away after a total of six hours. That means the health benefits fade away too. Although the effects are temporary, "were quite excited by the data," says Keen. He explains that the health benefits of the blood thinning and clotting prevention are like those of aspirin. Many doctors prescribe aspirin to patients suffering from heart disease, since blood clots are the major cause of heart attacks. The clots get stuck in the narrow confines of plaque-clogged arteries. In addition, thinner blood is easier for world-weary hearts to pump. "The rather clear message is that with reasonable serving sizes were seeing beneficial effects," says Keen. "People should not throw away their bottle of aspirin, but perhaps one should view chocolate as part of a healthy diet." 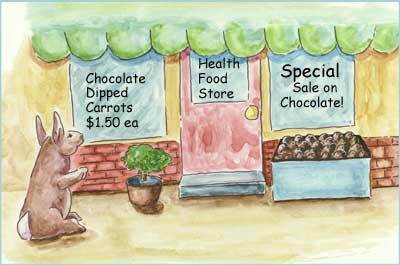 In a related study, UC Davis heart specialist Tissa Kappagoda found that chocolate makes blood vessel tissue relax. Using an extract made from cocoa beans, he immersed segments of rabbit aortas in a bath of water and cocoa extract to see if the tissue reacted to the extract. The relaxation was also touted as good for your heart, since the relaxation widens arteries and veins and could lower blood pressure. The results are preliminary, cautions Kappagoda. The effects may not be the same when the phenols have to go from the stomach to the bloodstream. A lot of health in a little kiss? Doctors now recommend a daily glass or two of red wine to their patients, but maybe they should be prescribing a little chocolate as well. It turns out that an average bar of dark chocolate contains more phenols than a cup of red wine, even more than a serving of beets, spinach and citrus. "Theres a couple of foods that fulfill the idea of a magic bullet, like tea and wine. Chocolate is one of them," says phenol expert Joe Vinson, a chemist at the University of Scranton in Pennsylvania. Vinson studies the phenol content of food. Hes analyzed fruits, red wine, vegetables, even herbs and spices. "Chocolate just stands out, its much higher than anything else," he says. Late last year, Vinson made headlines when he published the results of his work on chocolate. He found that a 1.5 ounce serving of dark chocolate has about 1/5 teaspoon of phenols. A cup of red wine has half that amount. In terms of phenol content, dark chocolate offers four times more phenols than a beet and ten times as much as an orange. Milk chocolate has a little less than red wine, and instant hot chocolate mix has practically none, reports Vinson. The best way to get chocolate phenols is through unsweetened baking cocoa, he says. The cocoa has almost twice the amount of dark chocolate, with no added fat or sweeteners. Despite all the remarkable things chocolate may do for the heart, scientists are still trying to figure out exactly how phenols interfere with diseases. "They may be wonderful, but we dont know why and we dont know how," says Gary Beecher, a member of the USDAs Food Composition Laboratory in Beltsville, Maryland. No one really knows how the phenols get from the stomach into the bloodstream. Even Keen admits they cant prove that its phenols like flavonoids that thin the blood. "We dont know for sure its flavonoids," he says. "It could be other things in the chocolate," such as the high concentrations of copper and magnesium. Another drawback for those who want to use chocolate as a health supplement is the fact that phenols dont stay in the bloodstream for long. Researchers at the Netherlands National Institute of Public Health showed that the concentration of the phenol epicatechin peaks in the bloodstream about two to three hours after eating chocolate. Phenols totally disappear after about six hours, a result supported by Keens study. Youd have to eat chocolate morning, noon and night to get a lasting effect, an option only for extreme chocoholics. Phenols also tend to bind to proteins, which means that eating milk chocolate or hot chocolate made with milk could prevent the absorption of phenols into the bloodstream. The lack of understanding isnt stopping candy companies from pursuing health claims, though. "Food companies are working on these things like crazy," says Vinson. Health claims are great marketing tools. Quaker Oats, claiming its oatmeal lowers cholesterol, has turned around its sagging market, with more oats sold every year. Sales of Cheerios rose 13% in one year after General Mills received permission to say the cereal is healthful. Despite claims to the contrary, could Mars really being funding chocolate studies for a purely scientific purpose? Probably not, since the company hired a public relations firm to handle the attention garnered by the results of the UC Davis study. The future of chocolate may lie in enhancing its antioxidant properties until they outweigh the fat and calories. "The real reason candy companies are spon soring this research is that they want to be able to put a label on candy bars that says that this bar contains antioxidants," says Beecher. Already, chocolate bars in Japan advertise their phenol content in big letters on the front of the wrapper. According to a food industry newsletter, chocolate manufacturers are working on approval in Japan to promote the anti-aging effects of chocolate, and the U.S. isnt far behind. Someday, you may be able to accept that Valentines gift with a pure heart, kept clean by chocolate.